Featuring co-hosts Mike Greenberg and former NFL player Mike Golic, Mike & Mike is ESPN’s personality-driven sports talk morning drive show. The show combines Mike & Mike with a mix of live guest interviews, analysis, breaking sports news coverage and opinion, all presented in a thoroughly entertaining format. The Mike & Mike simulcast is available weekdays from 6-10 a.m. EST on ESPN2. 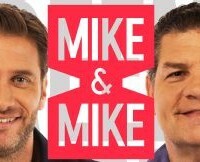 Mike & Mike is the most listened-to sports-talk show in the nation seen or heard by people each week. Mike & Mike airs on over 340+ radio stations around the country and can also be found on both Sirius/XM Satellite Radio. All four hours of the show are simulcast on ESPN2 reaching over 98 million homes and the show then immediately re-airs on ESPNEWS. The show can be heard live on ESPNRadio.com, the most listened-to radio stream in the world. ESPNRadio.com had a record 27 million page views in March 2013. The “Best of Mike & Mike” podcast averages over 1 million downloads per month.